Roger Federer: cold top lip? Can Roger Federer do it? The greatest tennis player of all time is after a record eighth Wimbledon Men's Singles title this year and most learned commentators seem to be of the opinion that if he manages it, it will be his greatest achievement at the All-England Club to date. This is due to a quirk of the ranking system: Rafael Nadal has spent much of the past 12 months with his knee elevated somewhere on a fishing boat in Mallorca recovering from leg surgery and, as such, is only the number 5 ranked player in the world. This means that, going by seeding alone, to win an OctoWimbledon Federer's path saw him having to beat Nadal in the quarter-final, Andy Murray in the semi and world number 1 Novak Djokovic in the final. An incredible challenge. Of course, in sport things are wont to change. Yesterday the bookmakers had Federer out at 7-1 to win the tournament. I rather suspect his odds will be somewhat shorter this morning. The headline news was that an out-of-sorts Rafael Nadal fell at the first hurdle to an inspired Steve Darcis in straight sets, but equally noteworthy in my book was the thunderous masterclass delivered by Federer on Centre Court earlier in the day. Up against Victor Hanescu, the Romanian player who is ranked the 48th best tennis player currently on Earth, Federer rolled back the years, playing shots of power, accuracy, grace and invention. His service, meanwhile, peppered the lines of the box, giving his opponent no realistic chance at all. It was a privilege to watch. But there's still something missing. The answer, nevertheless, is close at hand. Sat in the Royal Box watching, in fact: it was Roger's dad Robert Federer, the silver fox in a smart suit, sporting his trademark moustache. It was a strong look. Roger is definitely a chip off the old block as far as his appearance is concerned - he and his father look very alike. And then it struck me. The last few percent of any sporting success are always in the mind. That little spark of self-belief and confidence that can carry one competitor over and above another competing at an identical physical level. Roger Federer's path to history remains fraught with huge challenges, but I believe Roger Federer with a moustache would be unflappable and, more significantly, unstoppable. I have to admit that I would like Andy Murray, the plucky Brit with a heart of gold, to win Wimbledon this year. But I can never begrudge Roger Federer another title at The Championships, he is a magnificent sportsman and my admiration for him grows exponentially. If it came to it, I'd have to cheer on Andy Murray in a Murray-Federer semi-final. 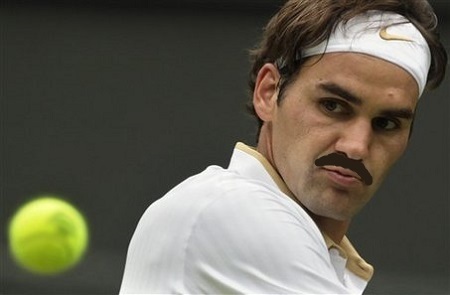 But a moustachioed Federer? No contest. Now, I am a reasonable man. I am, it's true, demanding that Roger Federer grow a moustache, but that is not to say that I will not be giving the great man options. Five options, in fact. Which style he decides to go with is up to him (or, indeed, you - democracy could well win through if you would like to leave a comment with your preference). But nature and reason and all the gods in their heavens have surely spoken: Roger Federer must surely grow a moustache. And then we'll have world peace. Simple, classic lines. Will make his father proud all over again. Is it hot as hell in here, or is it me? This just made my soft parts go hard and my hard parts go soft. Come on Roger, do it for all of us.